This is a painted portrait of Thomas Hamar Greenwood. Thomas Hamar Greenwood was born at Whitby on February 7, 1870 and left Canada for England in 1895. He was Chief Secretary for Ireland from 1920 to 1922 and died at London, England, on September 10, 1948. This oil painting was presented to the Town of Whitby Archives by Hamar Geenwood's cousin, Alexander Greenwood, of British Columbia, in September 1997. Lady Greenwood was an accomplished artist who went under the name "Van Margot". 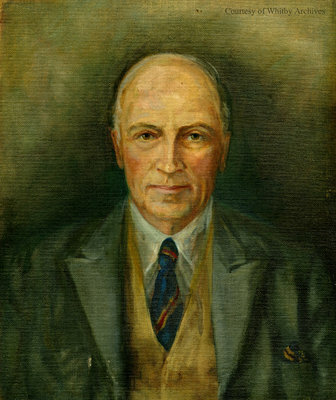 Portrait of Hamar Greenwood, c.1920-1930, Margery Greenwood. Whitby Archives 32-000-023.